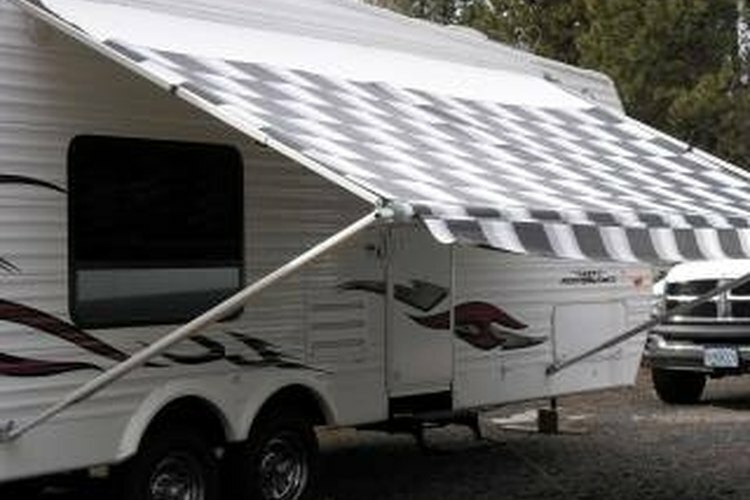 Whether because of age or a storm, you may have to replace the awning on your RV. While not an impossible task, it is best done with the help of two or three friends. Before you begin, make sure you have ordered a replacement awning that is designed for your specific RV model The steps to replace a vinyl RV awning are simple, but the process can take some time. Release the awning arms by either removing the cotter pins from the base of the arms that locks them to the RV body or pulling the release level on the upper part of the awning arm near the roller (usually on the right side of the awning frame if you are facing the RV, but it may vary by manufacturer). Pull the awning out until the fabric is completely unwound from the roller. Lay the awning arms flat on the ground with the fabric fully extended. Using needle-nose vise grips, reach up through the frame of the arm and into the shaft cap (the end of the roller) and firmly clamp down on the roller assembly attachment plate. Your helper should do the same thing on the other side of the roller at the same time. Remove the two lag bolts attaching the arm assembly to the roller attachment plate. Usually these bolts have a 7/16" head and nut, place a socket wrench on the bolt head and one on the inside nut, turn the wrench at the head clockwise while holding the nut in place. When the bolt has drawn out of the nut, the nut and bolt. If your awning has additional rivets in place (as on some newer models), drill these out. Lift and remove the entire RV awning assembly. Install your replacement RV awning by placing the roller into the shaft caps. Make sure the awning fabric is coming over the top of the roller toward the ground. Reinstall the lag bolts you removed and, if necessary, replace the rivets you drilled out with self-tapping screws. If the vinyl of your RV awning is beyond repair, cut it completely off the roller before removing, this will make the roller assembly easier to handle. Make sure all the tension has been released from the spring in the roller before disconnecting the assembly from the arms. Test this by letting go of the fabric of the awning, if it tries to "reroll," there is tension remaining, pull it out more until you feel the tension release. Make sure all the tension has been released from the spring in the roller before disconnecting the assembly from the arms. Test this by letting go of the fabric of the awning, if it tries to "re-roll" there is tension remaining, pull it out more until you feel the tension release.